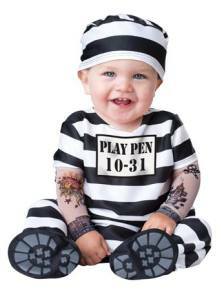 If your baby needs time out in the "pen", here's the perfect outfit in which they can serve their time. In fact, it's so cute, there's not a judge in the land wouldn't acquit even the naughtiest baby in a heartbeat. This well designed, well made costume comprises of a black and white stripe jumpsuit and cap. The jump suit has skid resistant feet and press studs at the crotch for easy nappy changes. It even has attached tattoo mesh sleeves, just like Michael Scofield from Prison Break! Perfect for fancy dress or themed parties, this costume comes in three sizes - 6-12 months, 12-18 months and 18-24 months and costs just £24.99 online.